The Vickers Light Tank Mk VI was the last in a series of light tanks built by Vickers-Armstrong. The company had achieved a certain amount of standardization with their five previous models, and the Mark VI was identical in all but a few respects, mainly improvements. 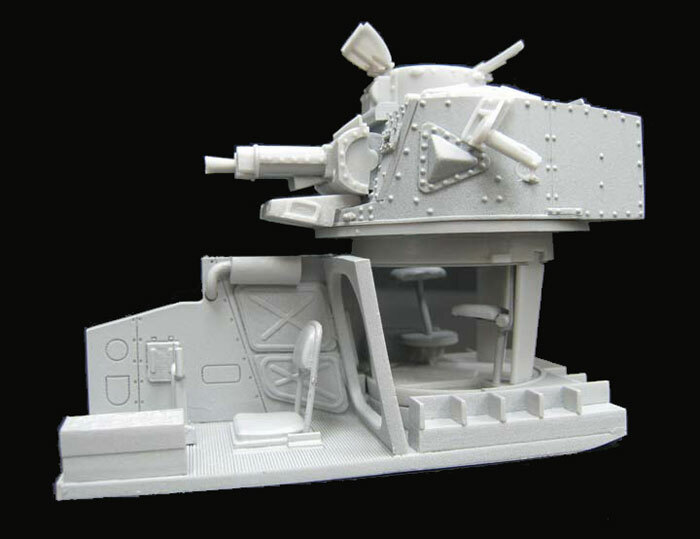 The turret allowed a three-man crew (driver, gunner and commander) to operate the tank and was enlarged to accommodate a Type 7 wireless set. The tank weighed 10,800 pounds, and had an 88 horsepower engine giving a maximum speed of almost 35 miles per hour. It had a strong and reliable Horstmann-type coil-spring suspension, but the tank had a tendency to pitch violently on rough ground, hindering accurate gunnery. The simple transmission had a tendency to reverse-steering on engine over-run (such as going downhill.) The Mk VI had between 0.15 and 1.6 inches of armor, able to resist rifle and machine gun bullets but not anti-tank projectiles or heavy shell splinters. Most Mk VI tanks carried one water-cooled .303 inch and one .50 inch Vickers machine gun. Overall, the British Army Imperial General Staff considered the tank superior to light tanks produced by other nations, and suitable for the dual roles of reconnaissance and colonial warfare. Production began in 1936 and ended in 1940 with approximately 1,000 produced. Many of those were modified to solve problems in the original design. The Mk VIA had a return roller removed from the top of the lead bogey and attached to the hull sides instead, and had a faceted cupola The Mk VIB was mechanically identical to the Mk VIA but with production simplified, including a one-piece armored louver over the radiator instead of a two-piece louver, and a circular cupola instead of the earlier faceted version. This is the version provided in the kit. The Mk VIC, last of the series, went on to have the commander’s cupola removed, had wider bogies, and fitted three carburetors to improve performance. It was more heavily armed than the earlier models, with co-axial 15-mm and 7.92-mm Besa machine guns. When the Battle of France began in May of 1940, the majority of the tanks possessed by the British Expeditionary Force were Mark VI types. When Italy declared war on Britain on 10 June and moved on Egypt on 11 June, the Mk VI was one of the most numerous tanks available to British forces in North Africa. While not the most famous, and certainly not the best of British tanks, it was extremely important in the first two years of the war. Kits of the Vickers Mk VI are not exactly thick on the ground. JB Models made a nice 1/76th scale plastic injection kit from which the principal Mk VI versions can be made, and which it seems is to be re-released soon by Airfix. 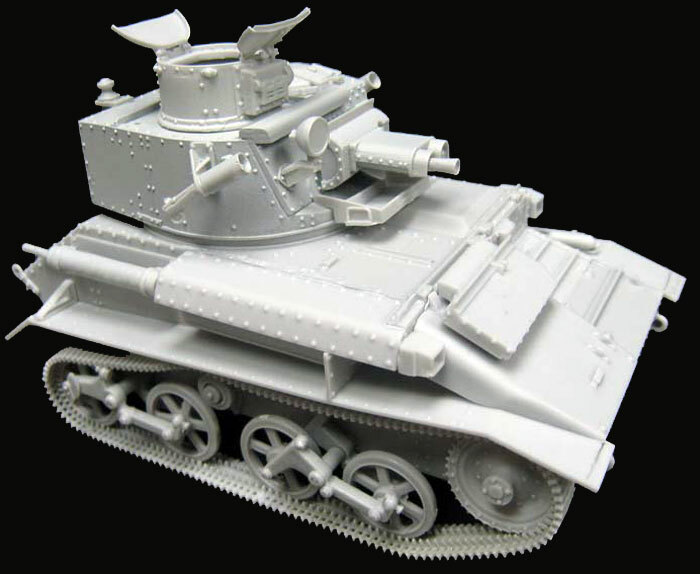 Completely ignored by the main-line makers, there is now an excellent cast resin kit of the Mk VIB available for those of us who prefer 1/35th scale from International Models of Asia (IMA). IMA plans a release of the Mk VIC soon; see their website at http://www.imaco.com.hk/ for details and ordering information. 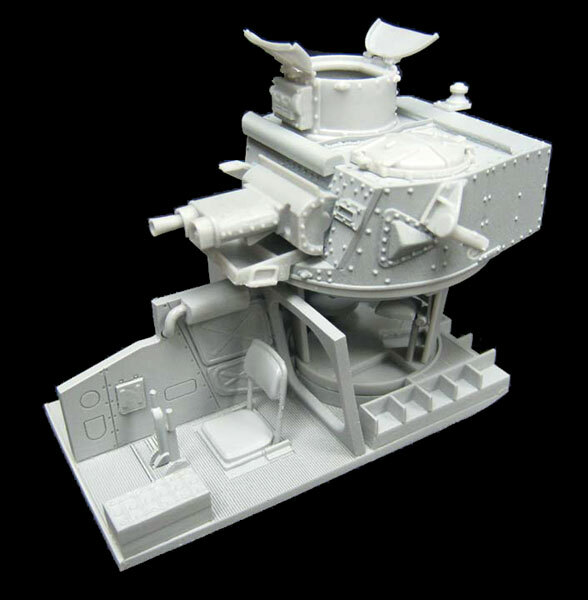 This is a small kit of a small vehicle, about the size of Tamiya’s Universal Carrier. Cleanly cast in a light grey resin, the kit has very little flash and cleans up well. The tank has a fairly complete interior, more than sufficient for visibility through hatches that may be left open. Of all the kit components, the interior seat details are probably the most delicate, and will require a light touch. However, if the worst happens, most of the interior details may be replaced by scratch-built parts. Many armor fans may want to add sand shields and other desert equipment, detailing like wiring, piping, a basic radio set, gun details and the like; most of what you need is probably in your spare parts box right now. Figures 1-4 are from the IMA pages, and show the main components of the kit and an overall view of the finished but unpainted model. The only difficulty a builder might encounter involves bending the resin tracks to fit the suspension. This is made easier by the tracks being in many short sections. In general, normal resin kit procedures apply. Use caution when sanding parts to fit: resin dust is dangerous and a mask or similar protection should be used. Complete in all respects except decals, there’s little to add in the way of exterior detailing except the odd grab handle, and of course any crew equipment, tarps, boxes, fuel containers (they would be flimsies at this time) and the like that you may want to use to dress it out. Light Tanks Marks I-VI, AFV Profile Number 5, Maj Gen N.W. Duncan, Profile Publications, no copyright date, but probably about 1972. British Armour in Action, Norm Harms and Steve Clayton, Squadron/Signal Publications, 1974. Focus on Armour, Camouflage & Markings, Number 2, British North Africa, Kenneth M. Jones, Almark Publications, 1977. British Tanks in North Africa, Bryan Perrett, Qsprey-Vanguard 23 (old series), 1981. 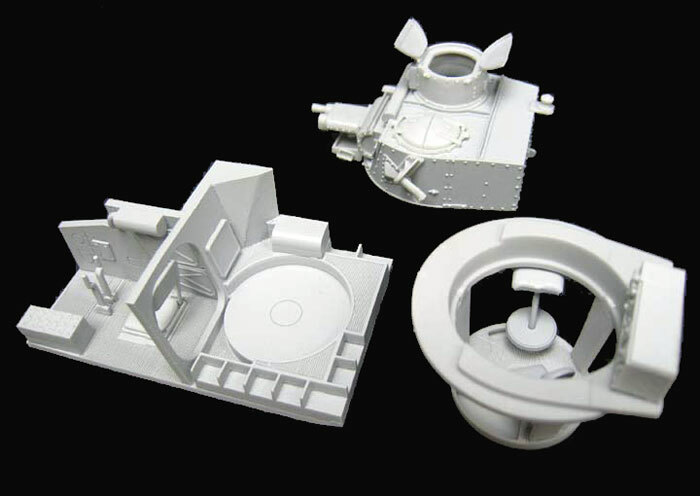 At a price of $95.00 plus $9.00 air-mail postage, the IMA kit is not inexpensive, but is worth it to those looking for a Vickers light tank. Mine arrived quickly and in excellent condition due to a very sturdy plastic box used for packaging and shipping. For those with an interest in early-war British armor, either in France or North Africa, this is a very welcome model indeed, and highly recommended.